The Zuma Concert Uke is a ukulele in the new California Fender series and is light, playable, and easy on the eyes â€” much like the famous Malibu beach that inspired its name. Good for either home or studio use, it offers a balanced, warm sound that is perfect for solo playing or for blending with other instruments. The Zuma features a laminated, lightweight sapele body that puts out great tone. In addition, a 16-fret flat-radius rosewood fingerboard offers smooth response and stellar playability. There's even a classic 4-in-line Tele headstock that lends this compact sound machine a bit of vintage Fender vibe. 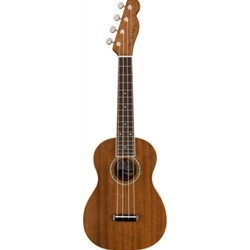 And even though the Fender Zuma Concert Ukulele is an excellent beginner uke, seasoned players will enjoy it as well!